In the category of Best Supporting Actor there are a lot of strong performances like Edward Norton in Birdman. 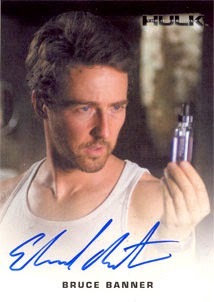 For 2008 Rittenhouse Archives Incredible Hulk Trading Cards, Norton signed two versions of cards. This common one was found in packs. This one was offered as a free alternate version as a 3 set incentive and was limited to 125 copies. But the frontrunner for Oscar has to be J. K. Simmons in Whiplash. It was an amazing film and his performance as Terence Fletcher was memorizing. 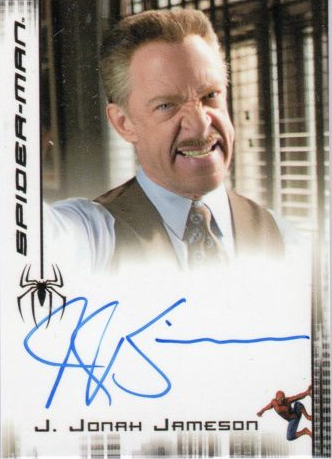 Simmons also played J. Jonah Jameson in Spiderman 3. 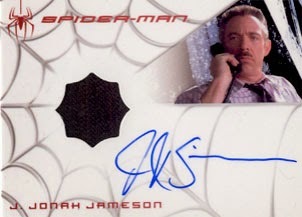 He also signed for 2007 Rittenhouse Archives Spiderman 3 Trading Cards. 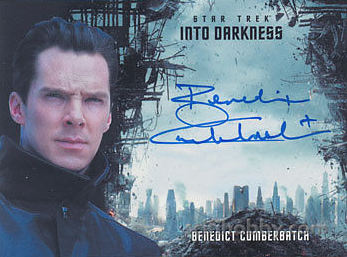 This is his autograph card from that release. There was also this 2 case inceptive Autograph Relic card. In the category of Best Actress the frontrunner has to be Julianne Moore as Dr. Alice Howland in Still Alice but there could be an upset. The most likely actress to be next in line is Rosamund Pike for Gone Girl. Her haunting performance give most men chills, and not the good kind. And speaking of chills, Pike also played Miranda Frost in Die Another Day. 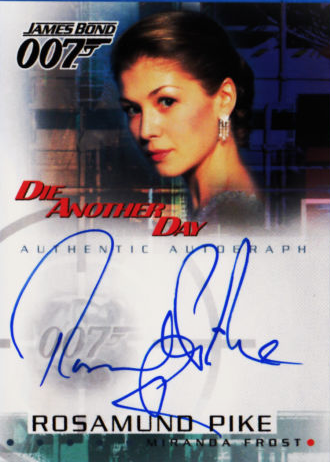 She Signed for 2002 Rittenhouse Archives Die Another Day Trading Cards. This is her autograph card. Eddie Redmayne will most likely win for his portrayal of Stephen Hawking The Theory of Everything. But another strong performance was turned in by Benedict Cumberbatch in The Imitation Game. He is the most recent singer for Rittenhouse Archives signing for 2014 Rittenhouse Archives Star Trek Movies Trading Cards. This is his autograph that was offered as a 9 case incentive from that release. And that will do it for this installment of Signature Sunday. Enjoy the Oscars!